Wallpaper Cycler is an easy to use, yet powerful desktop wallpaper manager and changer to get rid of that boring static wallpaper on your desktop. You can change the wallpaper with a specific delay or at specific times. Wallpapers are easily managed in multi-level categories which can have time constraints to give your desktop a time or season dependent look. For example: a category can be defined for wallpapers that will only be used in the summer, at night, etc. Categories can be linked to folders on your hard disk to automatically detect new wallpapers. A lot of attention has been given to the performance of Wallpaper Cycler. As a result, Wallpaper Cycler allows you to manage tens of thousands of wallpapers without slowing down. You can assign tags to wallpapers, layouts and/or categories. 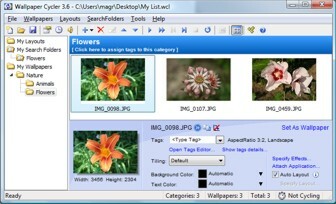 Tags can be used to link wallpapers to specific layouts, to create Search Folders which act as dynamic categories, etc. Tags can also be used in combination with the Smart Orientation feature to select for example portrait wallpapers when your monitor is in portrait mode and landscape wallpapers when it is in landscape mode. An advanced random selection algorithm is included to ensure that all wallpapers are randomly chosen before a wallpaper appears again. Wallpaper Cycler also includes a Windows Vista Gadget to control Wallpaper Cycler from the Windows Sidebar. Wallpaper Cycler goes much further than most other wallpaper cyclers. The powerful layout feature allows you to create your own custom layouts to be used on your desktop. Layouts enable you to show an unlimited combination of the following objects on your desktop which can be freely placed anywhere on your desktop. You can even add an object multiple times on the desktop each with their own settings. Any combination of effects (blur, brightness, color-tone, mask, texturize, ...) can be applied to each individual object. The effects system can be extended with 3rd party effects DLLs with the aid of the effects SDK. Wallpaper Cycler includes a screen saver module which shows a slide show of all your wallpapers with transition effects. It can also monitor your CPU load when it wants to cycle and prevent cycling when your CPU is too busy. Learn more about all the features. Wallpaper Cycler uses the beautifull Crystal icons created by Everaldo Coelho. There are two separate versions of Wallpaper Cycler. Wallpaper Cycler Lite is the freeware version and has limited functionality but is fully functional as a basic wallpaper cycler and is not time limited. If you want a much more powerful wallpaper cycler you should get the full (pro) version. Copyright © 2009 - NuonSoft. All Rights Reserved.